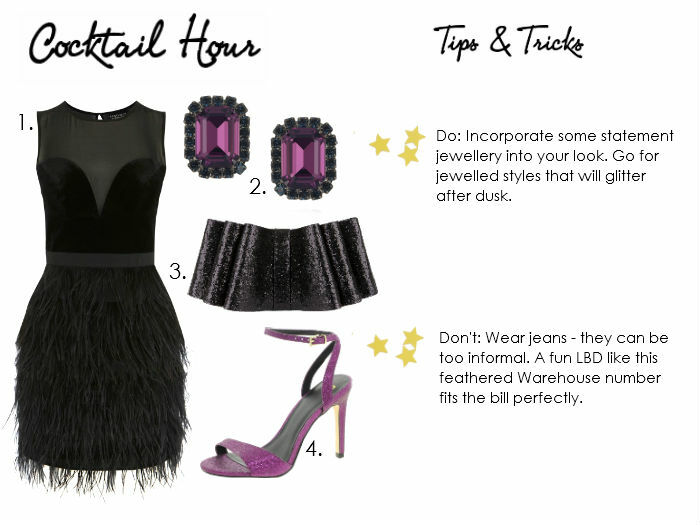 So here's the second of my blogposts themed around styling your christmas party outfits. Today I am tackling cockail hour, which I have to say is one of my favourite occasions to get dressed up for. The key to getting cocktail hour fashion right is dressing for low-lighting; look for embellished, jewelled and glitter-encrusted styles that will shimmer after dark. A touch of vintage styling is also key to this look; cocktails were popularised during prohibition in the 1920s and were the preserve of the 1950s housewife, so anything a little bit vintage feels highly appropriate! 1. Feather hem dress, Warehouse, £130. 2. Kenneth Jay Lane Swarovski crystal clip earrings, Net-a-porter, £60. 3. Ted Baker glitter origami clutch, John Lewis, £79. 4. Hustle heeled sandals, ASOS, £35.